Community members of Goshen are looking for new places to swim. When the Goshen College pool in the Recreation Fitness Center closed last fall, avid pool users like Linda SchlabachMiller and Sally Fuller, who taught water aerobic classes in the pool regularly, as well as regular lap swimmers and family pool users like Kevin Gary and his family, were forced to move on to other pools and opportunities—if they could find them. Unwilling to give up on her water aerobics class, Miller tried to find another pool to facilitate her weekly classes and encourage fitness. She was employedby the Goshen Parks and Recreation Department, where shenow instructs at the Goshen Middle School pool at 5:45a.m. Tuesdays and Thursdays while continuing her full time job managing the Goshen College Bookstore. “It was really hard to find times to use the pools at first,” said Miller. She noted that the school pools are used regularly by their own students and faculty while the community is now placing even more demand on them without the Goshen College pool. Even Goshen College swim classes taught by Val Hershberger now use the Goshen High School pool for a one-credit swim class. About half of the dozen or so people who attended Miller’s classes at the Rec-Fit Center followed herto Goshen Middle School, andseveral other newcomers from the community have joined as well. And Miller isn’t the only water aerobics teacher to continue her classes. Fuller has continued her work under the Arthritis Foundation as well.The Northridge High School Pool in Middlebury has opened its waters to the new class twice a week: Monday and Wednesday at 10:30a.m. 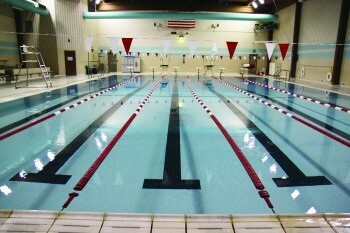 In addition, Essenhaus in Middlebury has agreed to allowGoshen Greencroft residents to exercise individually in its indoor pool for a small fee each week, and Goshen Greencroft Communities has collaborated further, supplying free bus transportation to and from both the Northridge High School pool and the Essenhaus pool. Although Fuller once taught a second water fitness class for the Association for the Disabled in Elkhart County (ADEC) at the Rec-Fit Pool, without a close and accessible pool in Goshen, thegroup now only exercises in the Rec-Fitness Center gymnasium. Together, Miller and Fuller used to hold a water safety and swim lesson workshop every fall and spring at theGoshen College pool, focused on increasing children’s comfortability with the water. Without a pool dedicated to the workshop for several days at a time, it is no longer a possibility. Fuller explained that many parents are enrolling their children in the new Shepard’s Swim School, located on Parkway Avenue in Elkhart, as a substitute, but the majority of parents have not because the cost of tuition to the swim school is $30 plus an additional $19 per class compared to $7 per class when the workshop in the Rec-Fit was in session. The loss of the Goshen College pool affected casual pool users as well as groups that used it regularly. Kevin Gary, Goshen College education professor, used the pool with his family several times a week. Gary said he often brought his children there for swimming lessons. “Each of them learned how to swim in the RFC pool and each now loves swimming because of the time we spent there,” said Gary. With the pool now gone, Gary has been unable to find a replacement pool for him and his family to use regularly, as they are able to use the Shanklin Park pool only in the summer. Miller, Fuller and Gary all agree that the closing of the Goshen College pool remains a loss for the community. However, surrounding communities as well as the Goshen School District have been stepping up to help fulfill the needs for water aerobic and swimming programs in the area. The Goshen School District is now planningto consolidatethe two pool spaces in the high school and middle school into one new pool as well as renovate music and physical education classrooms in a $17.15 million construction project. On September 10 a community hearing was held where Superintendent Diane Woodworth explained that the pool would be open to the public when constructed. Woodworth added, “[The new pool] would be a competition pool, [so] it’s going to be colder” as well as very busy most times, according to theGoshen News. Despite the temperature, the new pool would provide an open place for the public to swim and aid the Goshen community in its continuing need for pool spaces. The issue will go to vote in a referendum on November 5.If passed, the project aims for completion in December 2015.